References used while researching the history of "Sugar Baby"
75 ABW/HO. "Hill Air Force Base Heritage". Hill Air Force Base. 75th Air Base Wing History Office, 1 May 2013. Web. 6 June 2014. <http://www.hill.af.mil/shared/media/document/AFD-131104-188.pdf>. "Was It the Air Corps or Army Air Forces in WW II?." Army Air Forces Historical Association. Army Air Forces Historical Association, 1 Jan. 2011. Web. 1 Aug. 2014. <http://www.aafha.org/aaf_or_aircorps.html>. AFHRA. "Individual Aircraft Records." Air Force Historical Research Agency. U.S. Air Force, The Air Force Historical Research Agency, Maxwell AFB, AL., 8-Aug-1995. AFHRA. "Air Force Historical Research Agency - Home." Air Force Historical Research Agency. U.S. Air Force, n.d. Web. 27 July 2014. <http://www.afhra.af.mil/>. AFHSO. "Factsheets : B-26 Bomber, Martin or Douglas?. : Air Force Historical Studies Office. U.S. Air Force, Joint Base Anacostia Bolling, DC., 27 Apr. 2011. Web. 6 June 2014. <http://www.afhso.af.mil/topics/factsheets/factsheet.asp?id=15232>. ArmyAirForces.com. "ArmyAirForces.com Forum." ArmyAirForces.com of World War II. ArmyAirForces.com, 2013 Web. 7 May 2014. <http://forum.armyairforces.com/>. Baugher, Joe. "1941 USAAF Serial Numbers (41-30848 to 41-39600)." USASC-USAAS-USAAC-USAAF-USAF Aircraft Serial Numbers--1908 to Present. N.p., Last revised March 13, 2013. Web. 6 June 2014. <http://www.joebaugher.com/usaf_serials/1941_5.html>. Baugher, Joe. "USASC-USAAS-USAAC-USAAF-USAF Aircraft Serial Numbers--1908 to Present." USASC-USAAS-USAAC-USAAF-USAF Aircraft Serial Numbers--1908 to Present. N.p., Last revised 1 June 2014. Web. 6 June 2014. <http://www.joebaugher.com/usaf_serials/usafserials.html>. Conte, Ralph (Author), Jan Mees (Editor). " Attack Bombers, We Need You! A History of the 416th Bomb Group ". Mineral Wells, TX: JM Press, www.publishyourbook.com, jmp@nashville.com, R. Conte, 2001. Print. [ISBN: 9780971238701]. www.publishyourbook.com, Google Books, Amazon.com. Cookson, Rich and Rich Slone. "Tribute to Robert D. Cookson Sr. and B-29er's of the Marianas." Tribute to Robert D. Cookson Sr. and B-29er's of the Marianas. Rich Cookson and Rich Slone, 2010. Web. 6 June 2014. <http://www.cooksontributeb29.com/>. DiFante, Archie, Archivist AFHRA/RSA, Maxwell AFB AL. Emails and Correspondence, April to July, 2014. Dodge, William A.. "The Hobbs Army Air Field: Its History & Archaeology." The City of Hobbs, NM. Albuquerque, NM: Van Citters: Historic Preservation, LLC, 2008. Print. Available Online at URL <http://www.hobbsnm.org/files/planning/HIAP Information for City Web Site/HAAF History & Arch - FINAL.pdf>. Fuller, Craig. "Welcome to Aviation Archaeology." Aviation Archaeological Investigation and Research, AAIR. Craig Fuller, 1 Jan. 2010. Web. 27 July 2013. <http://www.aviationarchaeology.com/>. Hagedorn, Dan, and Leif Hellstrom. Foreign Invaders: the Douglas Invader in Foreign Military and US Clandestine Service. Leicester: Midland Publishers, 1994. Print. [ISBN: 1-85780-013-3]. Google Books, Amazon.com. Hausauer, Karl F.. "State of New York Annual Report of the Chief of Staff to the Governor for the Division of Military and Naval Affairs for the Year 1953." New York Division of Military & Naval Affairs. New York 7, New York: Office of the Chief of Staff to the Governor, Division of Military and Naval Affairs, 1953. Print. Available Online at URL < http://dmna.ny.gov/historic/research/AG_Reports/AG_Report_1953.pdf>. Mann, Robert A.. Aircraft Record Cards of the United States Air Force, How to Read the Codes. Jefferson, N.C.: McFarland & Co., Publishers, 2008. Print. [ISBN: 978-0-7864-3782-5]. McFarland & Co., Google Books, Amazon.com. Phillips, Jim. Pillars in the Sky, World War II from the Air. Self-Published by Jim Phillips, 1999. Print. Phillips, Jim. Emails and Correspondence, 2003 to 2008. Postlethwaite, Mark. "The Aviation Art of Mark Postlethwaite - Aeronautical Fine Art." The Aviation Art of Mark Postlethwaite. Sidewinder Publishing Ltd., 1 Jan. 2013. Web. 1 Jul. 2014. <http://www.posart.com/>. Roeder, James. A-26 Invader Units of World War 2. Oxford: Osprey Publishers, 2010. Print. [ISBN: 978-1846034312]. Osprey Publishers, Google Books, Amazon.com. Ronald V.. "Laon-Couvron." Abandoned, Forgotten & Little Known Airfields in Europe. N.p., 28 Nov. 2013. Web. 6 June 2014. <http://www.forgottenairfields.com/france/picardy/aisne/laon-couvron-s1126.html>. Sayles, Wayne G.. "416th Bomb Group US Army Air Corps." 416th Bomb Group. WGS. 1 Jan. 2007. Web. 26 Jul. 2014. <http://www.416th.com/>. Sgamboti, Carl. 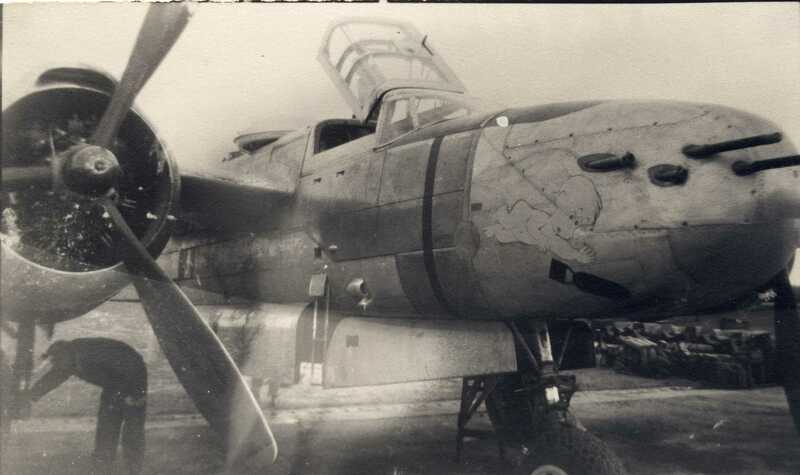 "Douglas A-26C Restoration Project." New England Air Museum. Carl Sgamboti, 31 Jan. 2010. Web. 16 Feb. 2010. <http://www.sgamboti.com/cts/A-26_Project/index.htm>. Sgamboti, Carl. Aircraft Record Cards and Interpretation for S/N 43-22499 ("Reida Rae"); Air Force Historical Research Agency, Maxwell AFB, AL. Silbermann, Paul. "United States Air Force Aircraft History Cards." Smithsonian National Air and Space Museum. National Air and Space Museum Smithsonian Institution, Washington, DC, 1 Jan. 2000. Web. 6 July 2014. <http://airandspace.si.edu/research/arch/findaids/usaf_iarc/iarc_frames.html>. Also available as a PDF file. U.S. Army, 1945-46 Historical Record of 4160th Army Air Forces Base Unit. Hobbs Army Air Field, Hobbs, New Mexico, from 1 November 1945 to 30 March 1946. Air Force History Support Office, Bolling Air Force Base, Washington, DC. USAF. "Statistical Control Technical Procedures, 1943-56", Air Force Manual 171-5 (AFM 171-5), "Termination Codes", Vol. IV, SC-16; Effective 1 May 1955 - 1 Jan 1961; United States Air Force. USAF. "Statistical Control Technical Procedures, 1943-56", Air Force Manual 171-5 (AFM 171-5), "Aircraft Assignment and Status Codes", Vol. IV, SC-13; Effective 1 Jan 1956; United States Air Force.